The biggest change in the new year of course is the birth of my second child. I also applied for and was chosen to teach a data journalism class at SIU-Carbondale beginning in the Spring. Other than that, I don’t know. After reviewing the year, I mostly just feel exhausted. The aforementioned child was born by the time February was here, so we spent most of the year adjusting to raising two kids instead of one. Took mostly small trips, in town. 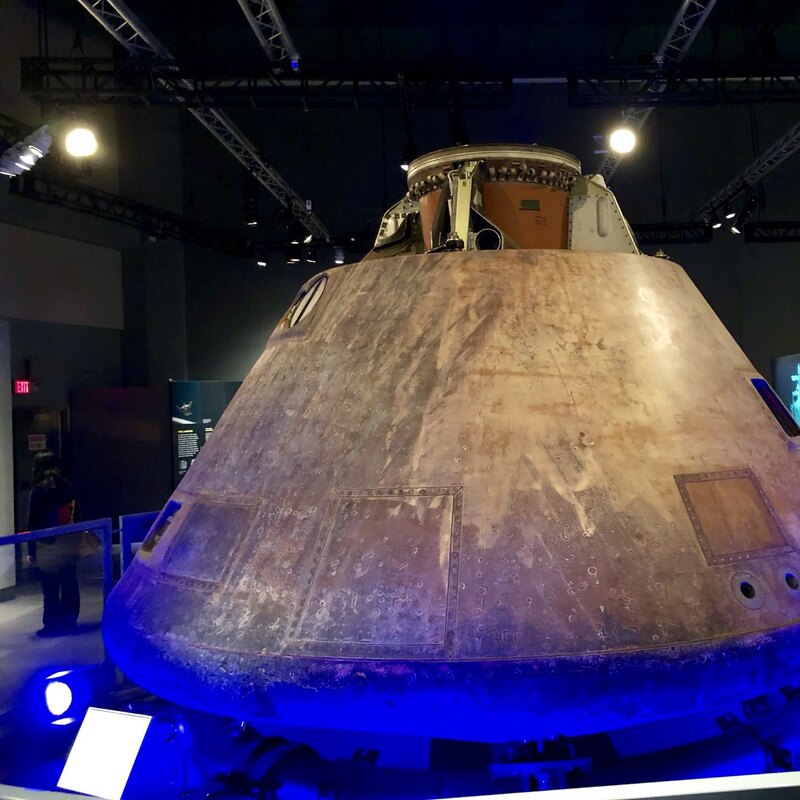 In April, we visited the St. Louis Science Center during an exhibit featuring the command module Columbia from the Apollo 11 mission. It was a surprisingly moving experience to be in the presence of it. Also went to a Cardinals game with my Dad in April, to the Zoo in May, the Transportation Museum in June, a Cardinals game in June, Grant’s Farm and the Arch in August, the Arch again in September, and the Garden Glow at the Botanical Garden in December. A couple larger trips my family took were to take the new baby to visit my family in May, another trip back there in Christmas and a trip to Carbondale, Ill. to fill out some paperwork for the job, when we also took in a football game and spent a day at Giant City State Park. In June I also stopped by Chicago for a day on my way home from a work conference and got to hang out with a friend and his family. Didn’t do much to our house this year, unfortunately. Did clean out the back fence line again this fall, and dug out an old lava-rock-lined flower bed on the north side of the lot. Also bought a new battery-powered lawnmower and weed trimmer, which are working out well. The singing with Greenleaf continues, beginning with a concert in January, as well as singing a bit at one of our member’s weddings. We also performed at the Renaissance Faire in Wentzville for three weekends, the concert at Eliot and our own concert in December. We finally sold tickets online for the first time for our own concert and that seemed to work well. 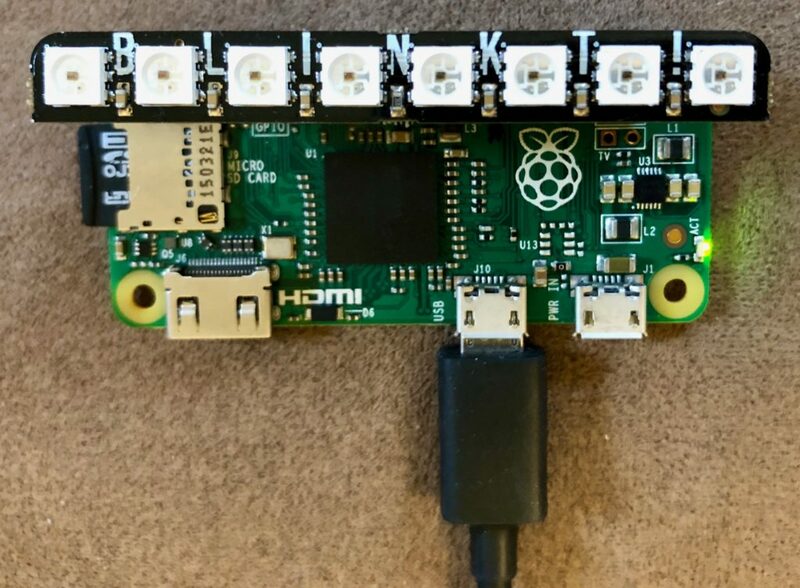 In February, I made a weather status indicator out of a Raspberry Pi and a Blinkt! module. Later in the month, I used a Scroll pHat HD and a Pi to animate a customizeable rainstorm. Inspired by the movie ‘Desk Set’ and its 1950s computer mainframe prop, I also coded up a version of that. I think I played exactly one round of golf this year, at the Prairies in Cahokia. 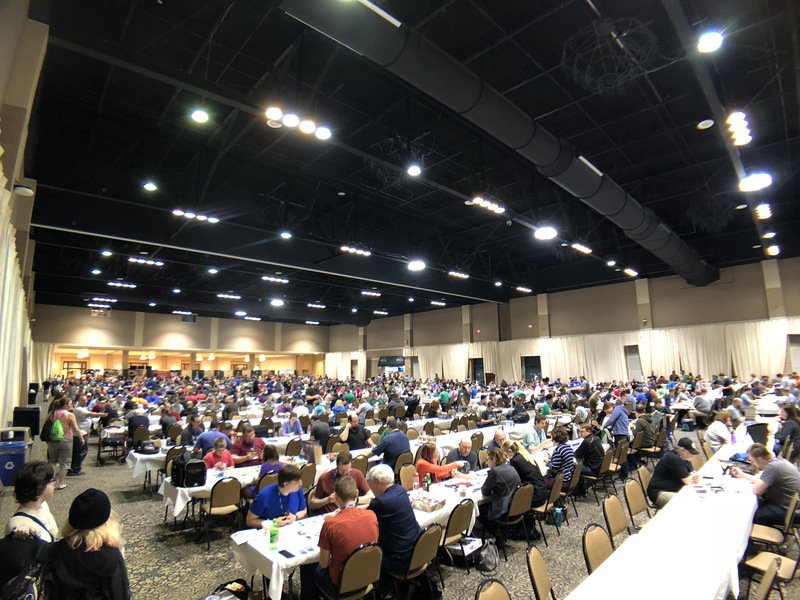 In May, Pam and I went to “Geekway to the West”, a board game convention in St. Charles. They have a game library with all different kinds, vendors and publishers running demos, and lots of door prizes. Between Thursday and Sunday, I played 22 games. It was a lot of fun — we plan on going back again this year. In August, I managed to finally use some scrap leather I bought at the Renaissance Faire the previous year to make a lcase for my AirPods. Turned out pretty good, and it was fun making it, although I haven’t done anything else with it. In August, I also went bowling for the first time in a half-decade. In September, I somehow got it in my head to go thrift store hunting. The first time out went pretty well, yielding a Gitman Bros. blue oxford shirt, a Land’s End pink OCBD, a Brooks Bros. broadcloth shirt and some Banana Republic Traveler Jeans. Around the same time I also nabbed a deal on a pair of new Levi’s for $13. Later in the year I got a couple new Jos. A. Bank corduroy jackets for $20 each, so I was feeling pretty well dressed by the end of the year. In October, Pam and I went to a board game cafe, Pieces. It was a good time. We played Jaipur, Hive, Medieval Academy and Potion Explosion. I keep on taking pictures. I bought a used Rokinon 85mm f1.4 lens, which I really enjoy using. Also got a 12mm f2 for Christmas this year, so I’ll be trying that out more too. A NYT article in early January led me to ‘Force Majeure’ a weird, dark movie about relationships in a Swedish family on a ski trip. It was good, and one of those splinter-in-your-brain-type movies. It was a 2014 movie, so nothing new, but new to me. While in Chicago for a work trip, I got to multitask and go to a Mac Power Users meetup and meet David Sparks, Katie Floyd, and Kourosh Dini, among many other fans of the show. It was a good time. I watched ‘Jesus Christ Superstar Live’ on NBC on Easter Sunday. It was quite good. 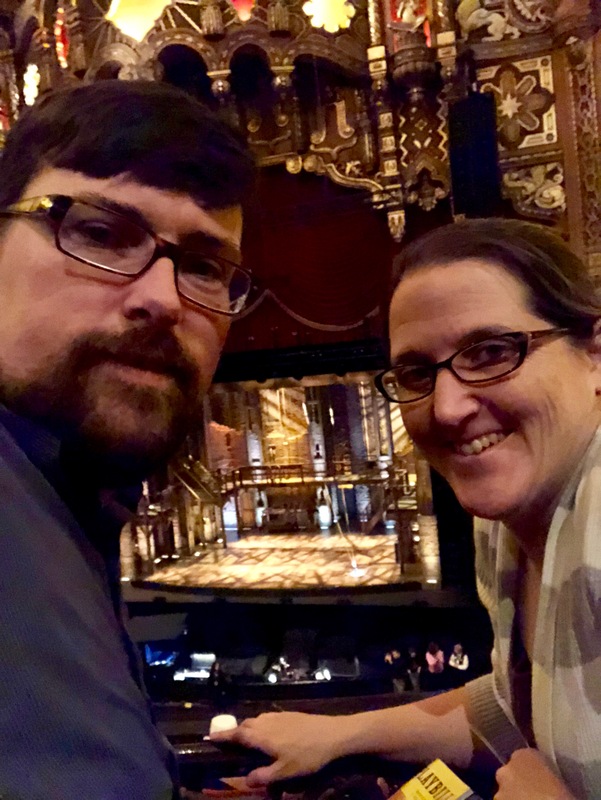 Also in April, I was lucky enough to win the lottery to see Hamilton at the Fox. Pam and I went, and it exceeded expectations. Just incredible. In August, I got to go see a couple friends performing in R-S Theatrics’ Light in the Piazza, which was delightful. I wasn’t familiar with the show or the soundtrack, and it was quite good. 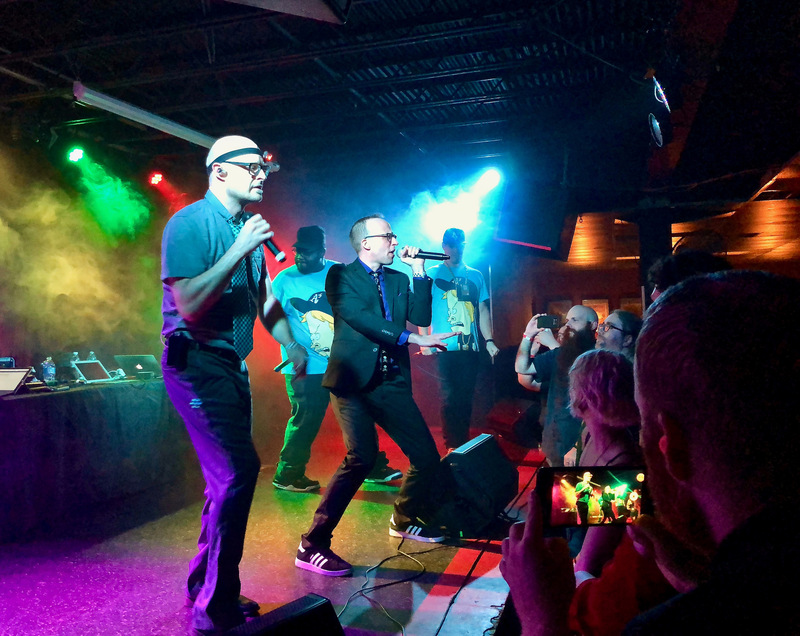 In October, the “Rushmore of Nerdcore” tour came to the Firebird, with Schaffer the Darklord, Mega Ran, MC Lars and MC Frontalot. I heard MC Frontalot on his last trip through St. Louis, and I’m glad I went again. I saw the Coen Bros’. Ballad of Buster Scruggs when it came out on Netflix. Not without its issues, but beautifully shot, and thought-provoking. Finally, in December I happened to catch that TCM was playing White Christmas in a few theaters on a couple nights, so Pam and I went to see that. She really enjoys the movie, and it was nice to see it in a theater. My first restaurant meal in 2018, according to my Twitter, was a Courtesy Diner Slinger, so it was pretty much all downhill from there. I also made it to Squatters Cafe several more times before it closed toward the end of the year. The chef is opening a new restaurant nearby, so I’m looking forward to that. On the aforementioned Chicago work trip, I went to Portillo’s for the first time. I also went to Eataly, which was a couple blocks down from the hotel and Shake Shack a couple times, which was right across the street. In September I got to take a VIP tour of the Schlafly Brewhouse downtown. It was interesting to see behind the scenes and in the basement, as well as taste some in-production stuff. I made Krupnik again, and it turned out great. I took some to one of the Greenleaf cast parties and it seemed to be a hit. I made some chili for our work chili cookoff in November. It did not win, but I thought it was pretty good. Got to make chili powder from scratch, too. 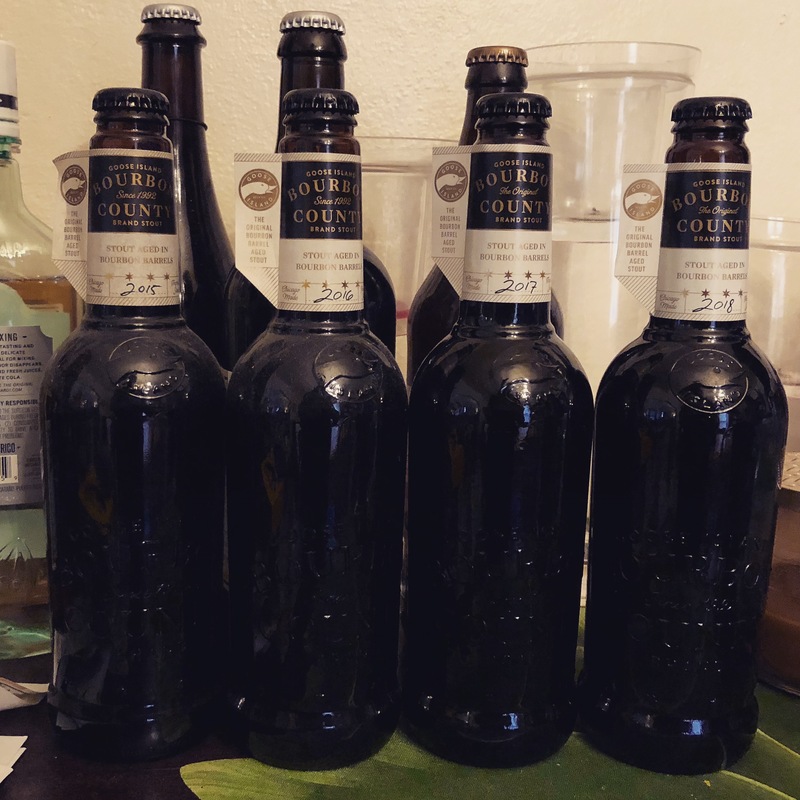 On Black Friday I managed to nab some bottles of 2018 Bourbon County Barrel Stout at Schnucks, so now I have bottles going back to 2015. Due to accidentally getting some extra 2017, I also cracked open a bottle of that, and it’s delicious, as expected. Got a new boss, got a new (side) job. Flew the drone a bunch, did a bunch of projects. I saw an opening posted for a temporary part-time person to teach a data journalism class at Southern Illinois University Carbondale, where I earned my degree from. It sounded like a good fit, so I applied, and I got it. I’ve been preparing for it ever since, and the first class is in two weeks. I’ll be commuting down there one day a week. So we’ll see how that goes. I’m excited. Worked on lots of projects this year: A 10-year look back at the Great Recession, a major project on the 25th anniversary of the Flood of 93, a neat little graphic tracing the path of a baseball at Busch Stadium, our election night graphics, a investigative piece on Northside Regeneration, and a year-end Best of 2018 project. And those are mostly just the larger projects, let alone the analyses, maps and daily graphics, tools, etc. In June, I also got a spot at SRCCON in Minneapolis. A bit higher-level/more conceptual than NICAR is (also smaller), it was great to be able to take a step back for a few days and focus a bit wider than usual. We finally got the drone and all the approvals and everything we needed to fly this year, so I got to take it out several times. I flew mostly in St. Louis, taking pictures of the new NGA site, the former Pruitt-Igoe site and St. Louis’ water towers. I also flew at a house that was flooded in 1993, though you couldn’t see the river from the house using the drone. 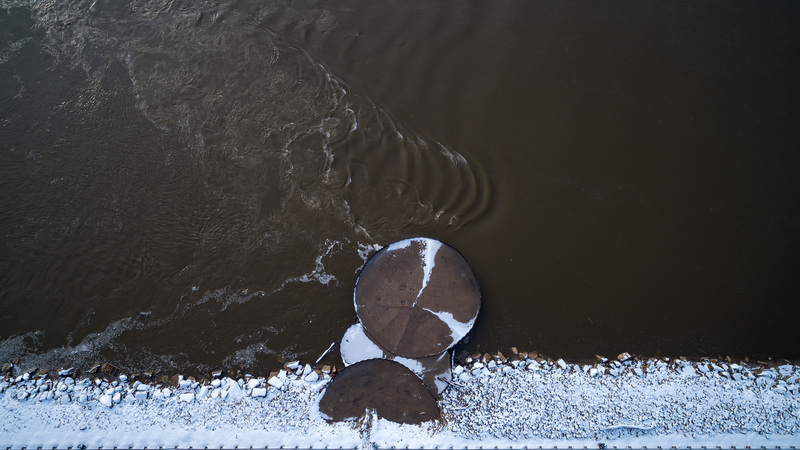 I got it out over the Mississippi River to take some photos and video of the Merchants Bridge. And I took it out after a snowfall in December and got some footage and photos of the Mississippi River from the Illinois side just south of Chain of Rocks Bridge. I was also on our radio talkshow in May to talk about the drone and how we’d use it, and again in July, this time live, to talk about Temporary Flight Restrictions in place around the President’s visit. I haven’t really done one of these before, so here goes. The biggest news was finding out we’re having a second kid. That should happen within a month, so we’ve been anticipating it most of the year. Decided this time around to not find out if it’s a boy or girl, thus doubling the difficulty of choosing a name. The current kid grows up more and more each week (as happens, I suppose). One of the most surprising things was when he began singing more: On the way home from school one day he knocked out a pretty good rendition of the National Anthem, and toward the end of the year he started singing a handful of Christmas carols including about three verses of Deck the Halls as well as more words of Feliz Navidad than I know. He keeps saying he wants a baby sister but we’ll see how it goes. 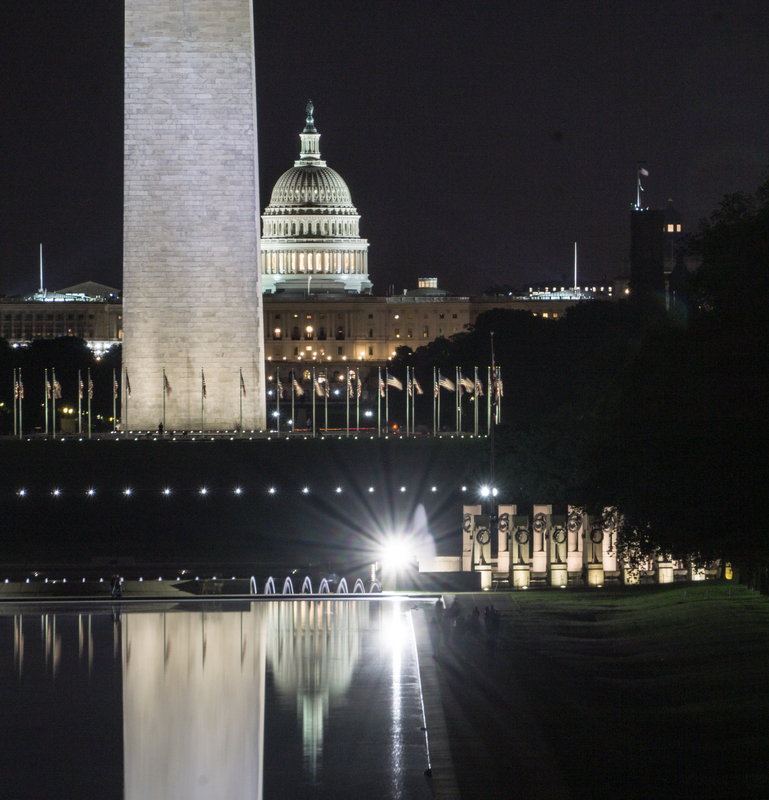 We took a few trips this year: We all took Amtrak to Washington D.C. for a week in May/June. I had a work conference there and Pamela and Maxwell came along. We got to see the sights and met up with Kate, Kevin and Ann, friends of mine from high school. Went to the Smithsonian Museum of Natural History, which was pretty cool. Bought a bunch of rocks as souvenirs. Flew back, Maxwell’s first time on a plane. He did fine — didn’t really realize what was going on, I think. Also went back to Danville in July for my aunt’s birthday party. 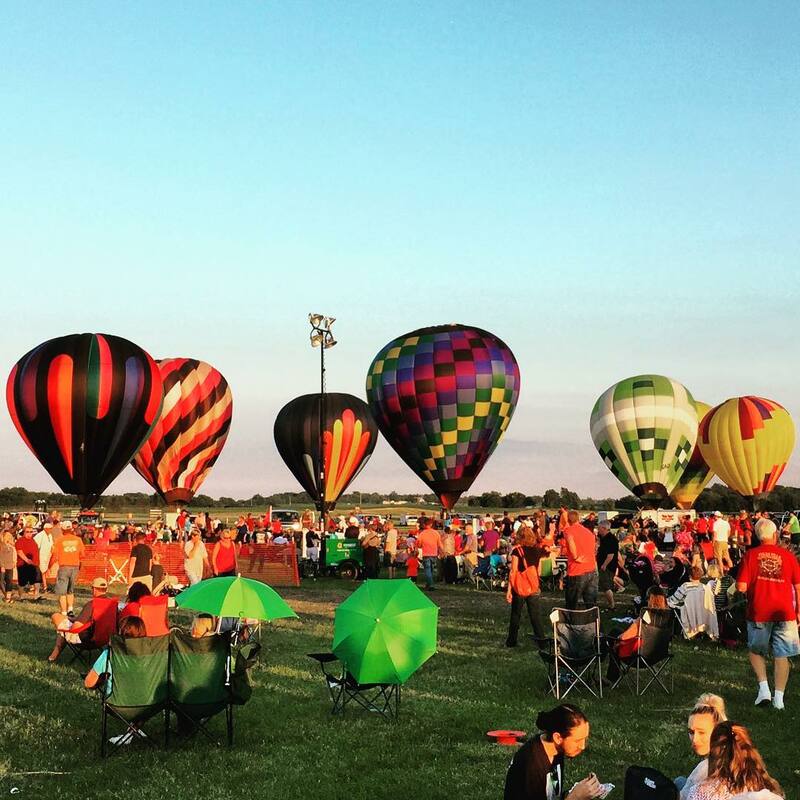 The hot-air balloon festival happened to be going on then too, so we went out to the airport to see that. Also went back in November for Thanksgiving, instead of for Christmas, because of the new baby. Not really an out of town trip, but we did go over to Columbia, Ill. to see the eclipse. I really enjoyed it. Not sure how to put it into words. Went on a couple other work trips. Got some work done around the house: Took a tree down in the backyard that was pushing the fence into the neighbor’s yard and got the one in front pruned. Also cleared out much of the invasive honeysuckle bush along the back fence, hoping to plant a hedge there in the spring. 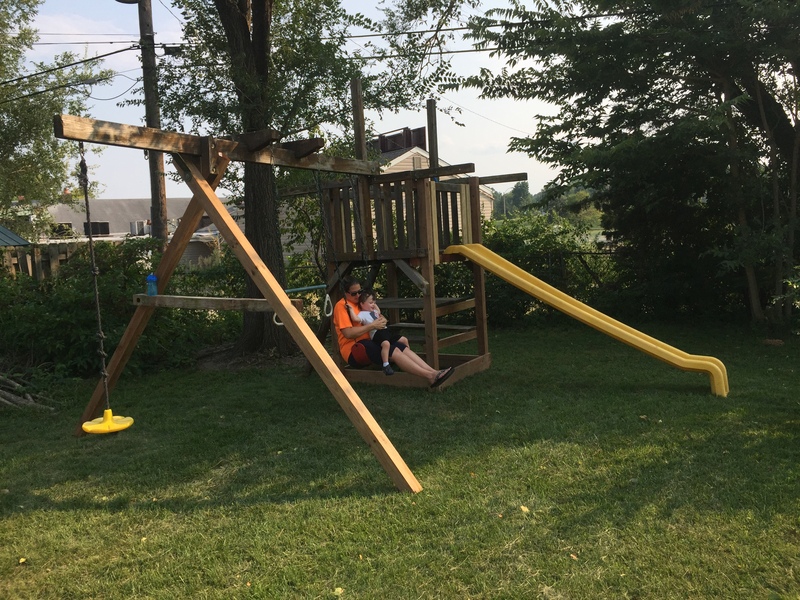 My friend Katheryn offered us a swingset that her kids had outgrown, so Pam’s parents and we went over there to break it down. Put it up in our backyard a couple weeks later when my parents came to visit, so my dad could help. Finally got the deck on the back of the house replaced. Also working on getting the upstairs in shape to move some of the kids’ toys up there and make a little more room for us down here. Played board games with friends a few times, and learned some new ones: Good Cop, Bad Cop; Arboretum (both played with Barb and Jim); Tiny Epic Galaxies (which I got for Christmas); Lost Cities (which Pam got for Christmas); Tournament at Camelot (bought for a game night with Barb and Jim). Also built a couple Kallax shelves from IKEA to hold our games and books and such to replace some decade-or-more old shelves we had in the dining room. Didn’t golf at all. Pamela did a bit, but I don’t think I got my clubs out once, even to go to the driving range. I did take up woodcarving for a couple weeks. When I was clearing out the yard I got a branch that I thought might make a good walking stick, and rather than leave the bark on as I did last time, I stripped it. I then got it in my head that it might be nice to carve a design into it. I picked up a basic set of chisels and a hunk of basswood (which I later found out is also Linden, which is coincidentally one of the trees I have) to practice with. Didn’t really get anywhere with it (I have block of wood with something roughly approximating a leaf in low relief on top), but I still have the walking stick branch in the basement so maybe next year. Kept on singing with Greenleaf. I handled our contract for the Renaissance Faire, which went okay. They insisted on five weekends, which was a bit overwhelming for our group. We took on a couple extra singers just for faire which helped immensely. We also finally nailed things down for a recording and did that in September. Got to sing at Eliot after missing it last year for Pete’s wedding. Also did our concert at Prince of Peace, did the St. Charles Christmas Traditions parade again and sang at the Daniel Boone House in an old chapel lit entirely by candlelight. Got a new iPad (the 9.7″ iPad pro), and upgraded my phone from a 6 Plus to an 8 Plus. Also backed a Kickstarter by Loog and got a cherry red 3-string electric guitar. Kid likes it too. 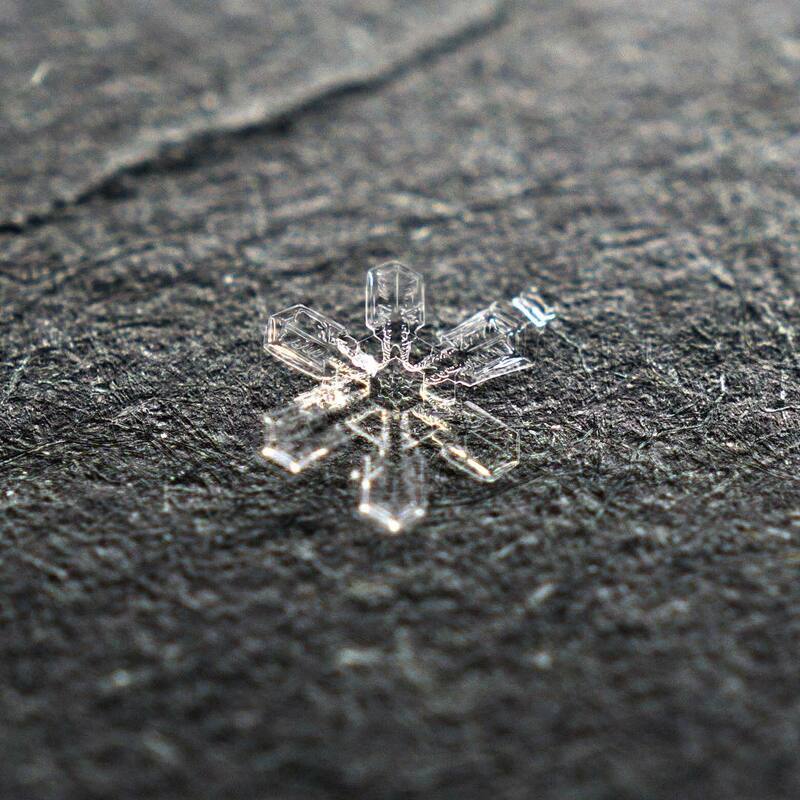 Got a macro lens for my camera for Christmas and I’m having a great deal of fun with it so far. Read fewer books than I should. Borrowed Raven Rock after hearing an NPR interview with the author. It’s about Cold War preparations in the U.S. for nuclear war. Quite thorough, and interesting. I enjoyed it. I also read Jonathan Franzen’s The Corrections and liked it. I got to see Chris Thile when he came to the radio station to play a show. I met him before he played and told him how much I enjoyed his hosting of The Show Formerly Known as A Prairie Home Companion (it wasn’t “Live From Here” yet) as well as his collaboration with Brad Mehldau, which I’d been listening to a lot of. I’ve mostly just kept up with podcasts — Merlin’s (Back to Work, Reconcilable Differences, and I started listening to Do By Friday), Marco’s (ATP and Under the Radar) and Pete’s (How to Be Awesome at Your Job) as well as some others (99% Invisible, Broadway Backstory, Mortified, The Moth, The Omni Show, etc.). Also S-Town. In live theater, there wasn’t much. Pamela and I saw The Moth on stage at The Sheldon when our station brought them in, and then I saw my friend Ann in New Line’s The Sweet Smell of Success. That’s about it, really — I need to see more shows. Most notably, I got to try some Pappy Van Winkle 12-year at the Royale in January. Pam had taken Maxwell up north to visit her grandparents, leaving me behind. There was a big ice storm here. Steven Smith posted a photo of the bottle on Twitter, saying “A good reason to leave the house. It won’t last long.” I was there in 10 minutes. In other booze news, I nabbed some 2017 Urban Chestnut Wolpertinger and the 2017 release of the Bourbon County Brand Stout. I had several notable meals. 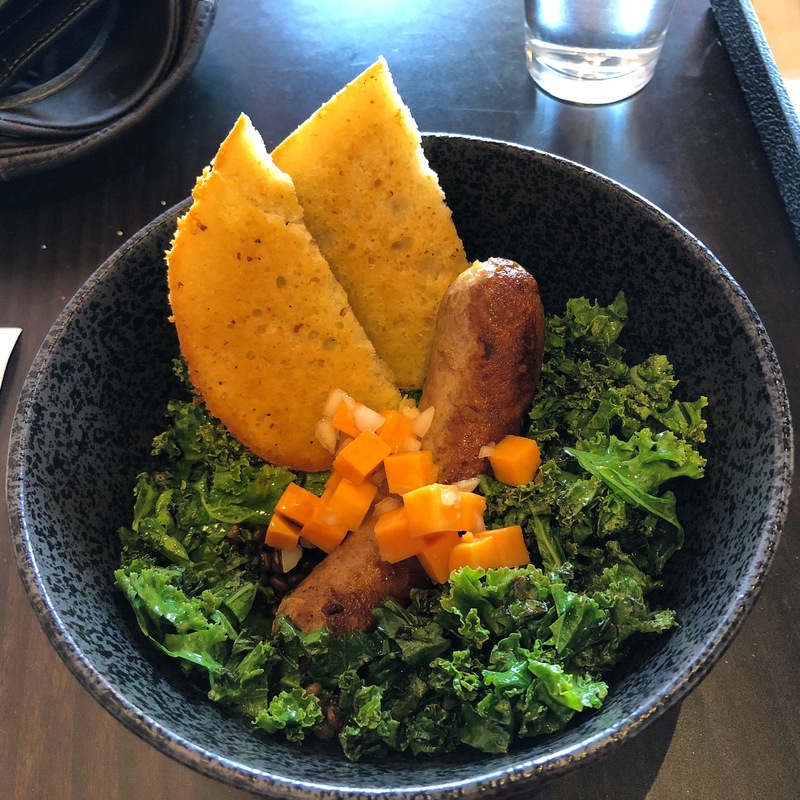 Anew, an event space near my job, had several “test kitchen/popup” things this year. 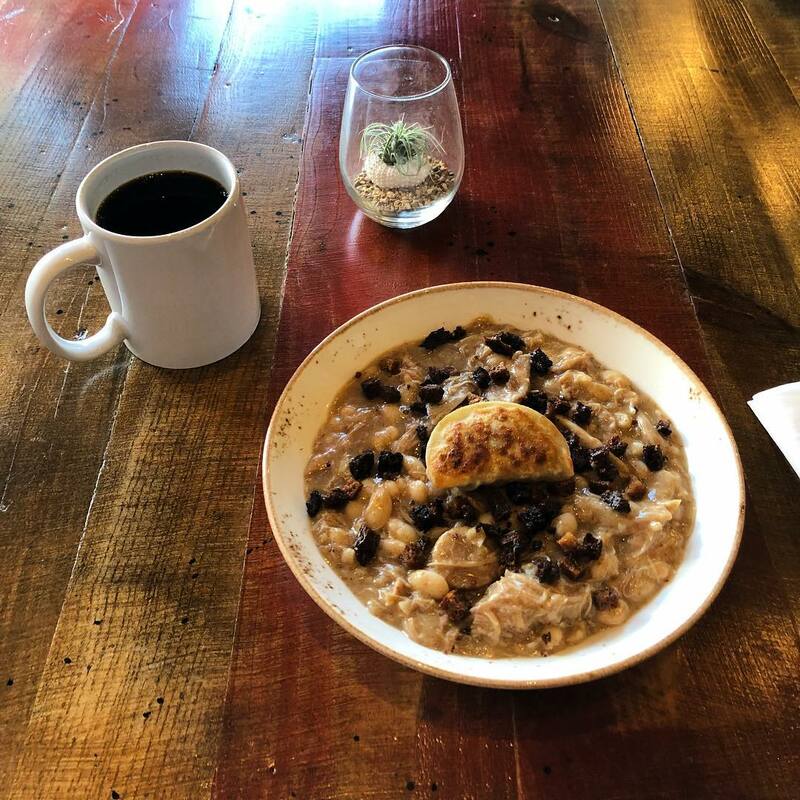 I went to one in March put on by The Social Affair with some delicious biscuits and gravy. Then there was one in December by Café Osage, where I had a pork schnitzel sandwich on challah bread. Both delicious. And a new place opened up down the street from work, inside KDHX: Squatters Café. I’ve only been twice, but each time has been great. Did some stuff at work. Lots of staff turnover. A couple trips. Lots of stuff to look forward to. Probably the biggest project I worked on was our Millennium Mayor project. It was a limited-run podcast focusing on a handful of days in the tenure of Mayor Slay, at the end of his run. I made a stand-alone website for it, and it turned out not too bad, I think (mostly because of the content, not my work, but still). Also put together a one-page mayoral candidates guide for the primary race that I particularly liked how it came together. Did a thing where we graded Missouri legislators. It was…okay. I like the idea, but there’s so much intangible that it would take a lot more human intervention to do well than we allowed for it. Published our “NFL Tweets” project — an idea by a reporter to ask who St. Louisans were tweeting about in the NFL since the Rams left. 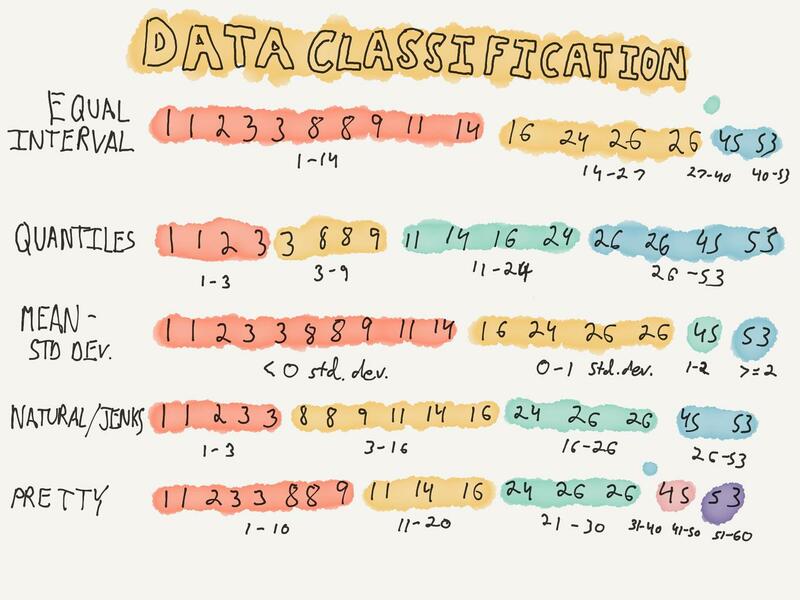 It also turned out alright — my largest dataset in a project to date. But that data came with some shortcomings that made it tough to draw conclusions from. Also did election graphics (of course), census graphics, a timeline of the East Saint Louis riots and a quiz to help figure out if you have the right ID to vote. Kicked off the year with a trip to Jacksonville, Florida for NICAR 2017. Good times. The hotel was a bit less conducive to hanging out than in prior years, but overall it was great. It’s always nice to be able to hang out with the folks I usually only ever see online. I also remember the river was just outside half of the conference rooms, so you could see the boats going by. In May/June I got to go on the aforementioned trip to D.C. for the Education Writers Association conference because We Live Here’s stories on racial disparities in suspensions was nominated for an award, and they asked me to present on it. I got to be on a panel with Nathaniel Lash, who presented on his Pulitzer Prize-winning project Failure Factories. 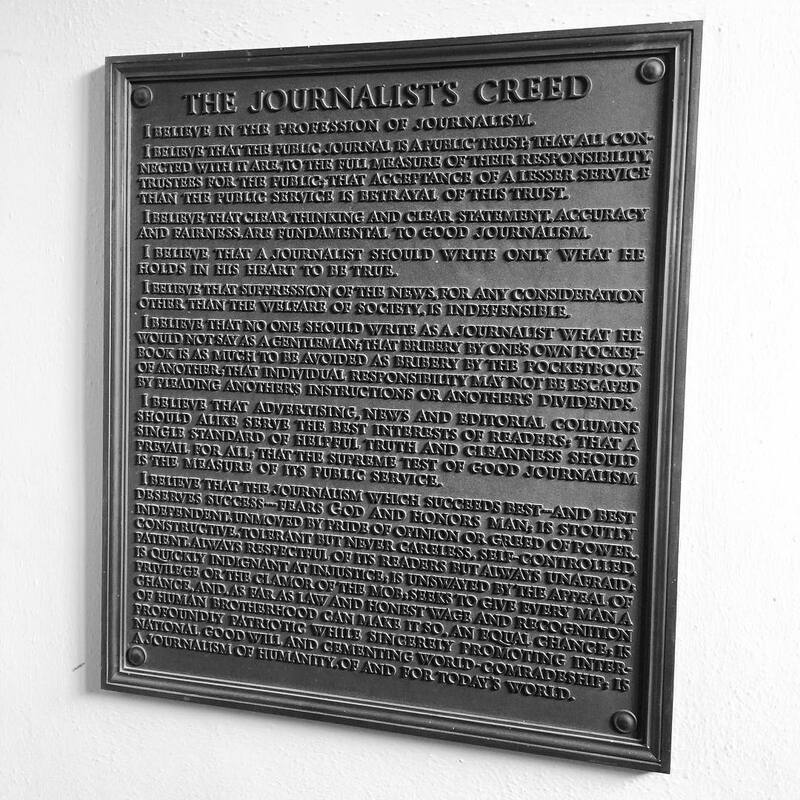 And in July, I filled in for coworkers at the Missouri Urban Journalism Workshop, a week-long “journalism camp” for high-schoolers at Mizzou. Most of the other instructors had some connection to Mizzou, but not me. Still, I had a good time and it was refreshing to get my head out of the code and get back to basics again. Also I got to meet some friends from KBIA for the first time, so that was nice also. Toward the end of 2016, when the FAA was getting ready to enact Part 107 to make commercial drone use easier, I went to a boot camp to learn what I needed to learn to get licensed. I pushed to get one at work, but it never materialized. Until this year. We got a donation earmarked for the purpose, so I took the Part 107 test (passed with a 95%), and spend the end of the year ordering, then testing the drone as well as putting together all our documentation and procedures about it. I’m presenting on it to the newsroom next week and am looking forward to using it in the coming year. I got to meet and interview Jer Thorp when he was here installing a project of his called the St. Louis Map Room. It aired, one of a few times I’ve been on the radio. That was fun.